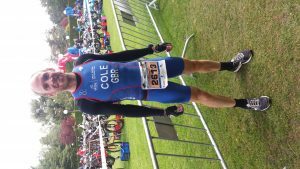 GOG Triathlon Club member Simon Cole represented Team GB in the European Duathlon Championships in Soria, Spain on 30th April 2017. Having qualified for the race in October 2016 Cole and his family travelled to the mountainous area of northern central Spain to take part in the race alongside a strong field of European athletes. In Coles age category of 35-39 GB and Spanish athletes dominated the start list but there were also representations from France, Ireland, Belgium and Italy. This standard distance duathlon comprised of a 10km run, 40km bike, 5km run on hilly terrain around Soria. The weather forecast for race day was 12 degrees, 30 mph winds and rain for the start, which made for worrying conditions. However thankfully as the day dawned athletes were greeted by a bright and breezy start without the rain. The first 10km run was four circuits of a 2.5 km loop, each loop had six 180 degree turns, a dizzyingly 24 in total. The turns combined with the incline on the course, along with the effect of the altitude (Soria is at 1000m, roughly the height of Snowdon) made for tough running. This was definitely not 10 km personal best territory. The local Spanish athletes dominated the first run but Cole ran well clocking 36.07 for his first 10km. The bike course was an out and back, 3 lap ride of 13km. The 180 degree turnaround point 6.5km SSW of Soria was actually at the same altitude as Soria. So athletes rode down out of Soria, with a climb up to the turnaround point and the reverse on the return. However, the breeze had been building to a strong headwind, so the return translated to a difference of 4 minutes on each outward leg. Cole clocked 1hr 15mins of riding time for the 40k bike a respectable time considering the wind. According to Cole the last leg of the duathlon “always goes fast so no matter how bad you feel, you just have to go for it”! And go for it he did recording 18.53 for the second 5 km run, notably the third fastest 5km overall. He finished the duathlon in a time of 2:14:06, 19th overall out of a field of 260 athletes. He was 6th in his age category and was the 4th GB athlete to finish. Guillaume Le Mouhaer, a Spaniard was the winner of Cole’s age group, and the overall winner in 2:05:55. Cole a promising multisport athlete, had a fantastic performance in Soria particularly in such testing conditions and given this was his first time competing at this level. He has just qualified to represent Team GB in the Duathlon World Championships in Canada later in the year, and hopes to qualify for the European Championship’s in Ibiza next year. 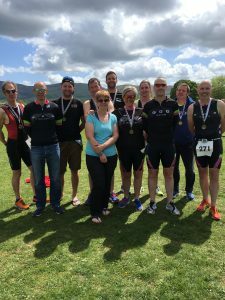 Ruthin Tri Stars hosted their annual sprint triathlon at Bryn Hyfryd leisure centre in Ruthin on the 14th May. Members of GOG Triathlon Club and their families have supported this event and the proceeding junior races since the clubs inception so it was no surprise to see a number of GOG’s in action. In the men’s race a strong GOG contingent impressively took 6 of the top 12 places. Pete Borlace finished 4th overall and third in his age category of 30-39 in 1.16.22 . Next home was Sion Hughes in 5th in 1.17.38, picking up a prize for 1st in his age category of 40-49. In 7th Martin Witty finished in 1.19.10, with another first in his age category of 50++. In close succession Andrew Williams was 10th in 1.20.34, Chris Wynne 11th in 1.20.46 and Paul Hooson 12th in 1.20.52. Next to finish was Stuart Goldsack in 1.24.37, Gwyn Jones in 1.24.59, Simon Hick in 1.25.14 and Bleddyn Evans in 1.25.14. In the women’s race continuing her good form Paula Stevens finished first for the GOGs in 10th place overall in 1.34.42. Rachel Surridge who was competing in her first triathlon finished in a respectable 1.40.21. 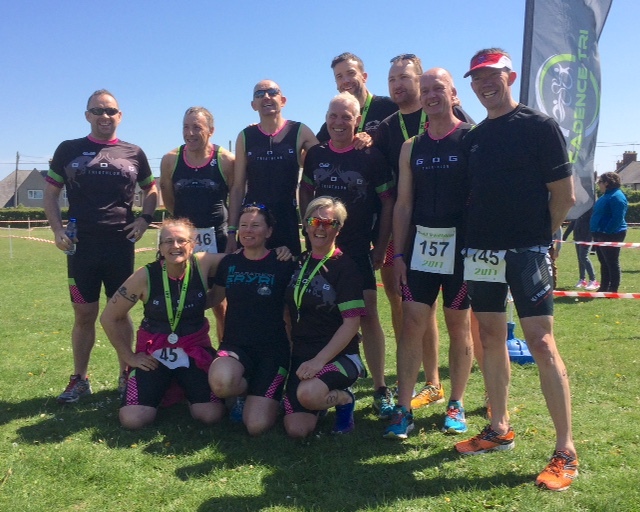 The GOG Squad were in action in the Cadence Triathlon Club Sprint Triathlon in Mold last weekend and took home several age group trophies demonstrating that putting the winter training hours in certainly pays off in Spring races. The triathlon started with a 400-metre pool based swim at Mold Leisure Centre, competitors then headed out on a testing 25km bike course that took in the infamous climb of the “Rainbow”, continuing to Graianrhyd, down Coed Talon then back to Mold. The run was a double 2.5km closed-road loop. In all this was a tough course, but almost perfect conditions made for some great racing. 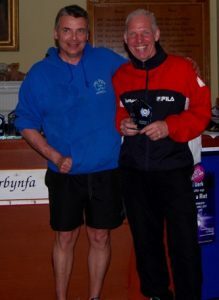 Club Chairman Simon Roxburgh was the first GOG to finish in 7th place overall with a 1.18.01. Simon flew around the bike course in 47.47 and picked up a well-deserved first in his age category M40-49 for his efforts. Tim Burnett was next over the line, 16th overall in 1.22.40. With another outstanding sub 20-minute run Geran Hughes finished in 1.23.42, 18thoverall. Geran was first in his age category of M50-59. Continuing his good form Paul Algieri finished next in 1.26.18 to claim second prize in the same age category. Andrew Williams finished 38th overall in 1.30.39. Richie Bartlett had a great race finishing 46th in 1.33.06. Taking another first in his age category of 60+ Malcolm Harrison finished 55th in 1.36.04. Stuart Goldsack finished in 1.38.58, most notably with some of the quickest transitions of the day. Sarah Gallacher had a fantastic first race of the year and finished 7th lady overall. Sarah was third in her age category 30-39. Paula Stevens who is improving in every race finished in 21st place and also third in her age category of 40-49 in 1.48.57. Laurie Griffith was next home in 24th place in 1.49.44. Dinah Hazeldine was 34th in 2.13.31. Elsewhere Simon Hick was the sole representative for the GOG Squad in the Betws Y Coed Quest Adventure race. This event comprised of a 42 kilometre five stage multi-sport route, where competitors trail run, road bike and even kayak their way between points in Gwydir Forest. Simon finished this gruelling race in 3.50.05 in 31stplace overall. Thanks to Deborah Robinson for the photo! The first local triathlon of the 2017 season, the Dyfi Dash, was held this week in Machynlleth. An early season triathlon in Wales will often mean racing in tough conditions and Sunday was no exception, with winds of 25mph gusting through the Dyfi valley. 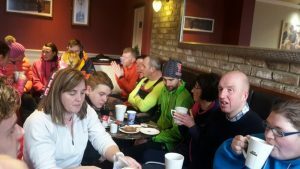 Six members of the club braved the weather and raced the sprint distance with 120 other athletes from all over Wales; with a 400 metre pool swim, a 19km bike leg and a 6km run. Paul Algeri was the first of the GOG Squad to finish, and the 15th male overall in a time of 1.15.37. Paul was second in his age category and put in a super swim time of 6.44, the sixth fastest swim of the day. He was followed by Simon Baldwin who was 23rd overall in 1.18.38. Next home was a regular at this race; Malcolm Harrison in 1.19.48 (photographed). This time enabled Harrison to defend his Male Vet age group category from 2016. Chris Van Hessing finished in 30th place in a time of 1.21.36. Representing the ladies, Emer Sandham was the fourth female overall to finish in a time of 1.18.42. Dinah Hazeldine another Dyfi Dash regular, had a good race finishing in a time of 1.53.18. The GOGs were represented across the region over the weekend in various events. On Saturday, the infamous ‘Pipe Dream’ fell race was held in Dolgarrog, the race is a five-mile route which heads out of the village and straight up the steps alongside the Dolgarrog Power Station cooling pipes with 1270ft of climbing in the first mile and 1700ft of climbing overall. Jack Smith Keegin was the first GOG home finishing 10th overall in a time of 40.06. He was followed by Daragh Reynolds in 41.44, Tomas Aldous in 43.28 and Huw Parry in 56.59. Helen Macarthur was first GOG female to finish in 50.16 and third in her age category, she was followed by Amy O’Hare in 53.12 and Emma Huntley in 56.57. On Sunday starting in challenging conditions on the Menai Suspension Bridge the club was represented by 10 runners in the Always Aim High Anglesey Half Marathon. First finisher for the GOGs in 31st place was Phil Lynes in 1.24.29. Lynes was followed by Simon Blain in 1.37.02, Paul Sander in 1.40.19, Richard Smith in 1.40.36, Gwyn Jones in 1.41.41, Gary Jones 1.45.21, Jason Breakey in 1.51.10 and Ryan Simpson in 2.31.36. Laurie Griffiths was first female GOG to finish in 1.49.14 followed by Geri Evans in 2.19.58. Simon Baldwin raced the 10k event finishing 9th in 48.43. In just as testing weather over at Oulton Park in Cheshire the Extra Mile Events Spring Duathlon was taking place. Welsh Champions Simon Cole and Sion Kelly Williams were taking part in the standard distance race and finished in 1.46.14 and 2.02.41 respectively. Cole was 6th overall and picked up a prize for 3rd in his age category 35-39, while Kelly Williams was 75th overall and 2nd in his age category U19. In the sprint race making his duathlon debut Paul Algeri finished in 1.24.05 followed by Malcolm Harrison in 1.29.48. Finally, further afield in Paris also taking on a half marathon with a truly international field of over 38,000 other runners were Michelle Lindfield, Cheryl Stewart, Megan New, Sharon Hughes, Celia Free, Sarah Hind and Sarah Massey (times not available when going to press). The GOGs had a busy few weeks with members taking part in events in north and south Wales. Simon Cole and Sion Kelly Williams headed to Carmarthenshire for the Pembrey Off Road Duathlon, which was also the Welsh Cross Duathlon Championship race. Cross duathlon involves a run- mountain bike-run format, and the distances for this event were 8km, 25km and 4km. Simon Cole finished in 2.02.00, 4th overall and 3rd in his age category of M20-39. Remarkably Coles fantastic run splits of 33.32.8 for 8km and 17.06.00 for 4km were the best in the whole field. Sion Kelly Williams finished in 2.20.23, twentieth overall and 1st in his age category of M17-19. It was great to see North Wales represented in this event and members of GOG Triathlon taking home Welsh Championship silverware. Club Members were in action in Denbighshire at the Bespoke Events Ruthin 10 km Race. Matthew Ashton finished first for the GOGs and 15th male overall in a time of 43.47. He was followed by Richie Bartlett in 49.47, and Simon Welland in 56.49. Angie Hughes was the sole representative for the GOG ladies and had a great run finishing in 52.51 and 3rd in her age category. 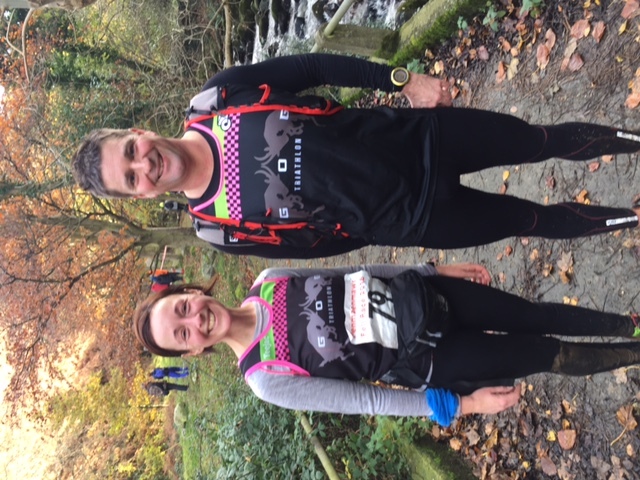 Finally, in Wrexham last week Andy Jones and Emma Hanson represented the club in the Village Bakery Half Marathon. Jones had a strong run finishing in 1.29.21 and Emma finished in 1.48.42. Please be aware that club events are now open for entry. The Llanrwst Triathlon and Welsh Aquathlon Championships will open on the 1st of March. Both have entry limits so make sure you get in quick. All events need marshals so any club members wishing to enter please contact Stu who will provide you with further details. 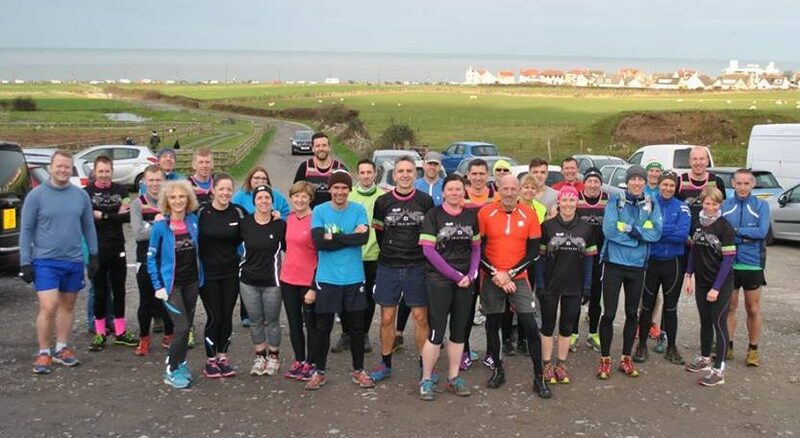 Sunday saw a fine turn out of GOG Triathlon Club in the North Wales Road Runners Nick Beer Roadrace around the Orme in Llandudno. Over 650 runners took part in the 25th Anniversary Race with over 29 of the GOG Squad taking part. First GOG to battle the wind along the finishing straight on the promenade and finish in a fantastic time of 34.01 was Simon Cole. Cole who is running very well at the moment was 9th overall, and picked up a trophy for 3rd in his age category of M35-39. Next to finish was Thomas Prytherch in 40.10. Sion Williams was third GOG home in 40.28, and was also on the podium for 3rd in his age category of MU20. Some great running and PB’s were recorded by other members of the GOG squad, in the following finishing order the results were; Andy Raho 41.21, Andrew Roberts 41.39, David Griffith 41.50, Andy Jones 42.02, Andrew Williams 43.01, Bleddyn Evans 44.35, Gary Jones 47.34, Richie Bartlett 48.26, Jason Breakey 48.36, Ashley Tomlinson 49.18, Merf Jones 50.03, Malcolm Harrison 54.08 and Simon Adey-Davies 56.05. The ladies were led home by Victoria Cole who is making a solid return to form after her maternity leave to finish in 46.41. Cole was followed by Sarah Gallacher 48.06, Nicola Tomlinson 48.56, Laurie Griffith 49.12, Angie Hughes 50.53, Mary Hancock 52.51, Megan New 54.27, Paula Stevens 55.33, Joanne Irving 56.29, Nan Roberts 01.00.28, Celia Free 01.02.49, Geri Evans 01.07.13 and Deborah Robinson 01.17.10. Emer Sandham has shared a?OneDrive?file with you. To view it, click the image below. GOG Triathlon Club members Merilin Sikk and Simon Blain (pictured) travelled to the Shrewsbury Cycle Track in Sundorn on December 28th for the 9BAR Sunrise to Sunset Challenge. The aim of the race is for runners to run as far as they can between the hours of Sunrise (8.20) and Sunset (16.01), the winner being the runner who records the furthest distance. Merilin covered 66 laps of the 1km circuit, attaining her target of over 40 miles. Impressively she managed to run nonstop through the day taking on food and drink on the move. According to Merilin the format of the race not only tests your endurance but also your patience! Blain ran 57 laps amounting to over 36 miles, another great effort and the furthest distance he has run to date. On Boxing day David and Laurie Griffith and Nicola Tomlinson took part in the Essar Chester Round the Walls race. The approximately 6km route follows a clockwise section of the Roman and Medieval walls, including passing under the iconic Eastgate clock, and finishes at the Racecourse. David finished in 51st place in a time of 27.24 mins, Laurie was 30th lady home in 32.17 and Nicola was 36th in 32.48. 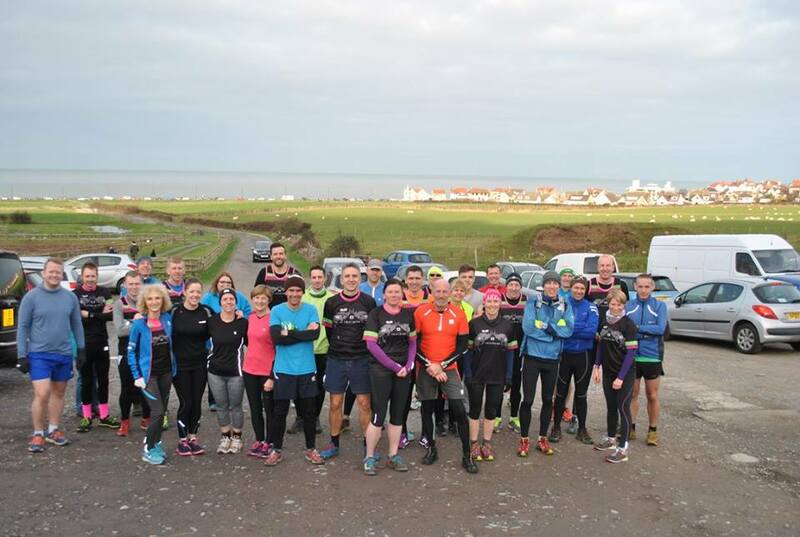 Over the festive period a group of over 30 GOGs enjoyed some trail running with a group run and social at Bodafon Farm. Some club members also took on the various charity swims with members dipping their toes in the sea in Penmaenmawr and Llandudno. This week the dates for the 2017 time trial series were set. Full dates will be added to the website in due course. In the meantime please view the Facebook site. Events can’t happen without help. If you are willing to assist at the TT either setting up, registration or help with timing please contact Laurie Griffith or Stu Goldsack. 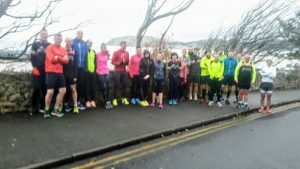 A good turn out at this year’s annual run around the Great Orme. Starting from Llandudno Pier the options were to complete the circuit or to turn around at the West Shore to make it a there and back run with double the climbing. The reward for the run was a well earned coffee in Nero’s. The planned swim at Penrhyn Bay was cancelled due to rough seas. 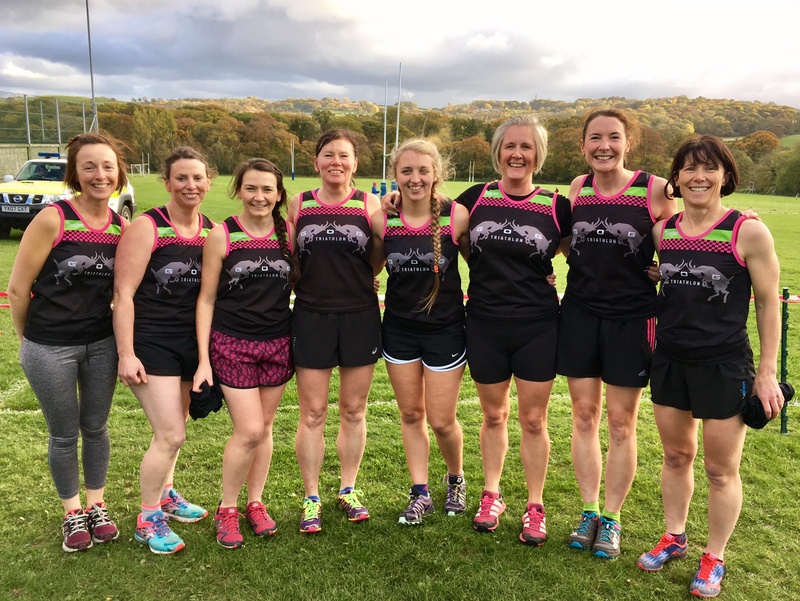 GOG Triathlon Club had another good turn out at the third round of the Grand Prix Express Cross Country League in Bangor on Saturday. In the ladies race Helen MacArthur was the first GOG to finish in 38th place in 24.18, she was followed by Laurie Griffith 25.38, Sarah Gallacher 26.19, Nicola Tomlinson 26.56, Angie Hughes 27.16 and making her debut for the season after maternity leave Victoria Cole had a fine run and finished in 77th place in 27.37. Maintaining their 5th place in Division 1 of the League, the male team fielded a team of 10, and first to finish for the GOG Squad was Simon Cole in 9th place in a time of 33.17. Cole was followed by Geran Hughes 38.12, Simon Blain 38.12, Simon Roxburgh 40.00, David Griffiths 40.59, Andrew Williams 41.31, Matthew Ashton 42.19, Paul Hooson 43.31, Huw Parry 45.13, Stuart Goldsack 47.17 and Richard Bartlett 47.36. If you are interested in triathlon or would like to know more about the sport check out the clubs website or facebook group, just search GOG Triathlon. Members of GOG Triathlon Club were out in force this weekend attending local events in Penmaenmawr and Conwy. The Pen Fell Race traditionally marks the end of the fell racing season in Snowdonia and comprises of a gruelling 16.1km run with over 595 metres of ascent. 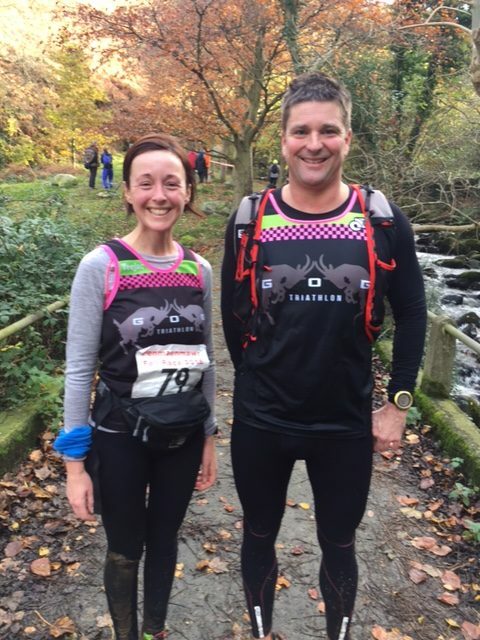 The race usually attracts a good field of hardy fell runners and this year they were joined by GOG Triathlon Club members James Wan, Huw Parry, Tracey Price and Gary Jones. Wan had a strong run and finished in 47th place in a time of 1.37.42. He was followed by Parry in 142th place, Price in 147th, and Jones in 154th. On Sunday along with 2408 other runners 18 of the GOG Squad departed Conwy at 10am to run around the Orme and back on the Run Wales Conwy Half Marathon. As well as the 18 runners taking part a number of club members were involved in this local event in Conwy and marshalling around the course on foot and bike. The 34th female to finish in an impressive time of 1.39.21 was Helen McArthur, she was followed by Nicola Tomlinson 1.49.19, Laurie Griffith 1.53.10, Joanne Irving 2.05.49, Sarah Massey 2.13.36, Sonja Griffith 2.24.12, Celia Free 2.24.12 and Natasha Kettle in 2.40.15. The combined efforts of the ladies saw the GOG Triathlon Ladies Team finish in a respectable 6th place overall. The 140th man and the first GOG home was Chris Berrington in a time of 1.33.58. Chris Wynne has a fine run finishing marginally behind Berrington in 1.34.20. Reliably strong David Griffith finished in 1.35.58, followed by Richard Smith 1.44.05, Paul Hooson 1.44.50, Tomas Aldous 1.45.27, Sion Hughes 1.48.26, Gwyn Jones 1.53.26, Carlo Galeotti 1.58.42 and Richie Bartlett in 2.05.23. The club are delighted to have been nominated for Club or the Year in this year’s Conwy Sports Awards and are looking forward to attending the Awards Ceremony this week. Last weekend St David’s College in Llandudno hosted the second race in the North Wales Cross Country League and the local fixture ensured a good turnout of runners and supporters for GOG Triathlon Club. Putting in a strong performance on the mixed terrain Helen MacArthur led the way for the ladies, followed by Emer Sandham, Laurie Morris Griffith, Alexandra Aldous, Nicola Tomlinson, Paula Stevens, Evelyn Heffernan and Tracy Price. In the men’s race Steve Lyall was first home for the GOG Squad, and was chased to the finish by Geran Hughes and Daragh Reynolds, followed by David Griffith, Andy Jones, Simon Roxburgh, Andrew Williams, Simon Blain, Paul Hooson, Paul Sanders, Huw Parry, Simon Hick, Stuart Goldsack, and Simon Adey-Davies. Meanwhile in Denbighshire Sarah Gallacher was the sole GOG Triathlon Club Member taking on the Fell Hell 10km race, which saw athletes racing through the Clwydian Range and over Moel Famau. Sarah made an impressive return to form and was the 13th lady to finish in a field of over 300 runners. Also over in East Wales on Sunday Chris Bennett was racing in Minera at the North Wales Cyclo Cross Series. Bennett raced well but was unlucky to puncture on the final lap of the tough course. If you are interested in triathlon or joining the GOG Squad the current training schedules are on the GOG website or Facebook group ‘GOG Triathlon’.